According to AP, Tiger Woods will speak at the Lincoln Memorial on Sunday as part of President-elect Barack Obama's inauguration festivities. Tiger Woods will speak at Tiger Woods, who has tried to stay out of politics during his ascent to one of the world's most famous athletes, has accepted an invitation to speak at the Lincoln Memorial on Sunday as part of President-elect Barack Obama's inauguration festivities. Woods rarely gets involved in political discussions and festivities. He was criticized in 1997 after his watershed victory in the Masters when he turned down an invitation from former President Bill Clinton to travel to Shea Stadium in New York to celebrate the 50th anniversary of Jackie Robinson breaking baseball's color barrier. After Obama's landslide victory, Woods said on CNBC he was hopeful that a black man would be elected president in his lifetime. Tiger Woods shot the highest round in his professional career — an 85 — in the third round of The Memorial Tournament in Ohio on Saturday. Tiger speaks at the Lincoln Memorial on Sunday.Tiger Woods made his first appearance at a political event on Sunday but failed to mention President elect Barack Obama even once. The world's most recognisable athlete broke the habit of a lifetime when he agreed to address the "We Are One: The Obama Inaugural Celebration at the Lincoln Memorial". But anyone hoping for a repeat of Martin Luther King's "I Have a Dream" speech, delivered at the same location in 1963, were severely disappointed. 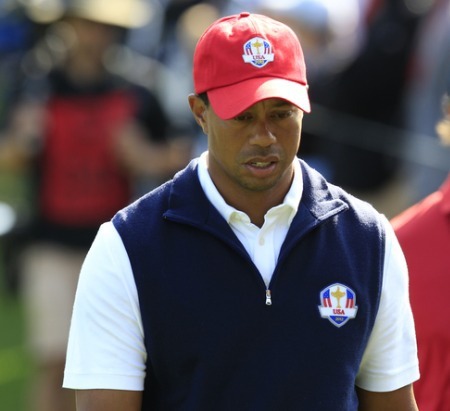 We saw the two faces of Tiger Woods on the opening day of the Ryder Cup at Medinah. Photo Eoin Clarke/www.golffile.ieWinning captains do no wrong. Losing captains are goats. It’s one of the unwritten Ryder Cup laws and Davis Love’s decision not to bench Tiger Woods for yesterday afternoon’s fourballs will only be judged with the benefit of the 20/20 vision that we call hindsight.